Ms. Ameen’s father immigrated to the United States from Pakistan in the 1960s. She grew up in Chicago, where her family hosts vibrant iftars, one of the names for the evening meal that breaks the day’s fast. An iftar may be as elaborate as the truffle-laden platters on display in the dining room at the Four Seasons Resort in Dubai, in the United Arab Emirates, or as simple as chicken and rice, passed out free on paper plates at a mosque. For home cooks, who often take turns hosting an iftar or carrying their homemade food to share at community centers and mosques, it’s time to shine. Malika Ameen at home in Chicago. Many will strategize for the days ahead, planning menus and cooking in bulk. Keeping a few labor-intensive dishes ready to warm through can minimize the time spent hungry, in an unreasonably fragrant kitchen, when there are hours to go before the day’s first bite. She stocks her freezer with homemade samosas to last the month, ready to crisp in hot oil or to pop into the oven in small batches. Ms. Saab fills hers with kibbeh, the bulgur wheat and beef shaped by hand into tiny, plump footballs, and makes big pots of lentil soup. Of course, not everything can be done in advance. Ms. Ameen will also put together light foods she finds ideal for a fasting stomach, like fruit chaat, a tangy, savory fruit salad made from what’s ripe that day and in season, all marinated with cumin, dried mango and chiles. Dahi vada also makes appearances throughout the month, the lentil fritters soaked in a cool sauce of yogurt and a second of sweet-sour tamarind. It’s a dish that her family serves this time year and no other, and as it’s garnished, the perfume of toasted, crushed cumin rises. “That smell, to me, is the smell of Ramadan,” Ms. Ameen said. The diversity of Muslims in the United States is reflected in a wide range of foods that will break fasts all month long, from casseroles of macaroni and cheese to es campur, the Indonesian dessert of fruit and jellies, from the Nigerian bean fritters known as akara to asheh, a herb-packed Persian soup. “But the fast is a reminder that food is a means, not an end goal,” said Faiyaz Jaffer, a research scholar and chaplain at New York University’s Islamic Center. The center will serve iftar to nearly 300 people each evening, catering from restaurants such as Soul Spot in Brooklyn and Fatima’s Halal Kitchen in Queens. 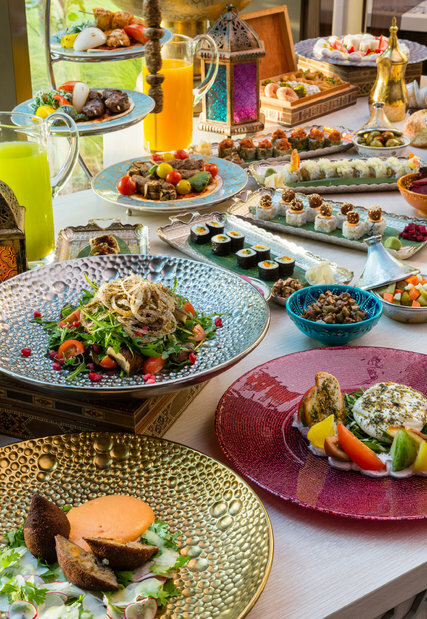 An elaborate iftar laid out at the Four Seasons Resort in Dubai in the United Arab Emirates. Though not all Muslims choose to fast, fasting is one of the Five Pillars of Islam, and many are connected by it each year. “It’s a test of our willpower, a way to emphasize our spiritual dimension,” Mr. Jaffer said. Ramadan is the ninth month of the Islamic lunar calendar, and this year it falls at the tail end of spring and the beginning of summer in the United States. The days stretch out, long and hot. “I will make a big salad every day, and that is not negotiable,” said Ms. Saab, who likes to pace herself with light foods that will hydrate and nourish. For her Lebanese-American family, she prepares juicy variations on fattoush: a range of crunchy vegetables, herbs and leafy greens tossed in a simple, lemon-sumac dressing with pieces of warm fried flatbread. Ms. Saab also serves fattoush at “Dinner With Your Muslim Neighbor,” the meals she hosts twice a month for friends of friends, colleagues and locals she has met via Facebook. 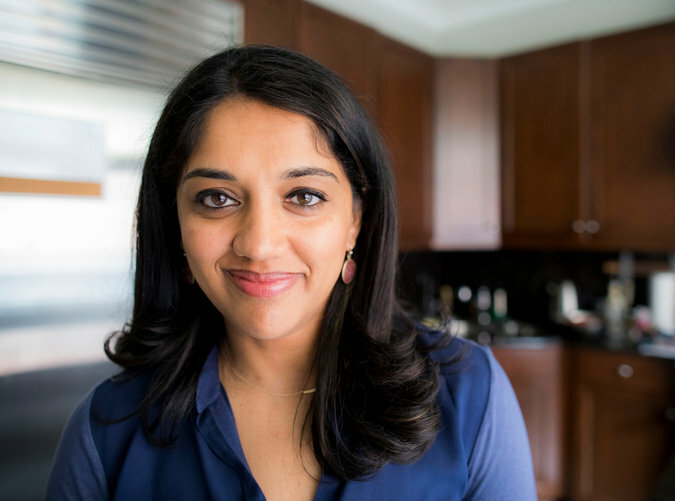 She started the dinners with the idea that she could complicate and add nuance to the national understanding of Muslim Americans, one person at a time, by inviting strangers into her home and offering them seats around her table. It’s work, but Ms. Saab wants to continue these dinners during Ramadan. And she has been moved by people from outside of her faith, eager to fast by her side for a day. “I think it’s so generous that they want to fully embrace and engage,” she said. Skipping food and drink for well over 12 hours can put stress on the body, which immediately struggles against dehydration and hunger. “It’s a big change to go from three meals a day and snacks to fasting, and all of a sudden that energy isn’t coming in,” said Mark Mattson, chief of the Laboratory of Neurosciences at the National Institute on Aging, who studies the effects of fasting. Bim Adewunmi in her apartment in Brooklyn. “Just like it takes a while for your cardiovascular and muscular systems to adjust to the stress of exercise, the bioenergetic challenge of intermittent fasting is the same,” he said. It can take weeks, or in some cases up to a month, for the body to adapt to more restricted time windows for food. 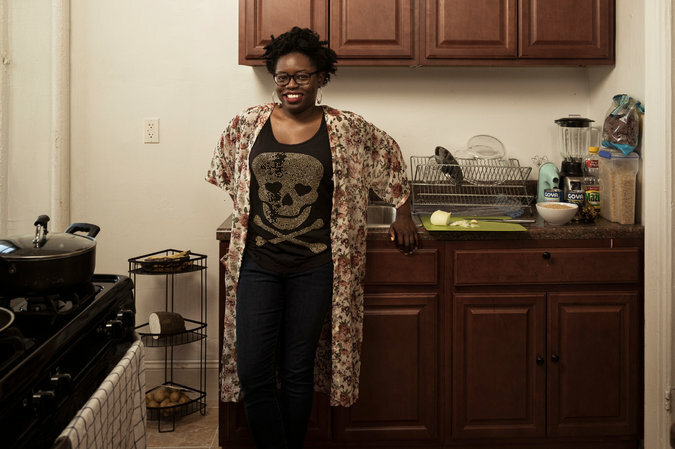 Ms. Adewunmi, 34, cooks for ease when fasting, focusing on carbohydrates and protein, often preparing a single, simple recipe on a loop all month. She found the spinach recipe on a halal food blog, an adaptation of the Italian chef Antonio Carluccio’s green dumplings. It was ideal for breaking fast at home the way she liked, with comforting food she could warm up and eat in small doses throughout the evening, a strategy of hers for breaking the fast. Last year was Ms. Adewunmi’s first living in New York. Far away from her family and friends during Ramadan, she found herself alone between work and home at sundown. She stopped in a Punjabi-owned bodega in Manhattan and asked the shopkeeper if he had anything with which she could break her fast. Ms. Adewumni doesn’t like dates, truth be told. But in the moment, and in the spirit of the month, she found that it didn’t matter. The only thing that mattered was the generosity of a stranger, the small and beautiful kindness. She ate four.